Kitchen island removal is the thing to do. That is, if you want a little more walking space in your kitchen and the island which is situated right in the middle no longer serves a very useful purpose, you can remove it. 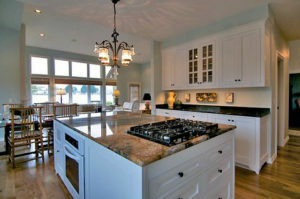 Kitchen islands come in many shapes and sizes, and offer different types of functions. Some are equipped with power outlets and water, along with extra storage space, while others serve as storage and food preparation space. These fixtures are installed to be used for many years and are sturdy structures. Should you choose kitchen island removal, you’ll have a big project ahead of you. Underneath it, the floor might be unfinished, meaning you’ll expose the subfloor, or, it could be tiled, but those will look worn and grimy. Whatever the case, you’ll need to call a junk hauling service to cart the debris away, because you’ll have a lot of it to dispose of once you remove it from the kitchen. To prep the work area, spread plastic or drop cloths around the island and cover the countertops to protect them from dust and debris. Next, you need to completely empty your kitchen island out and place the contents in other storage spaces. Secure the power. If your kitchen island is equipped with power outlets, turn off the breakers supplying the electricity. You don’t have to cut the wiring or remove the power outlets, but you can do this if you plan to use them in the future. Turn off the water supply. If your island has a small sink, you’ll have to turn off the water supply and then unhook the drain line. In addition, you’ll have to remove the faucet and pry the sink out of the top. Remove the molding and trim. Using pry bars, pry away any trim and molding that’s tacked onto the surface. You should also remove the cabinet doors and pull out the drawers at this time. Take off the island countertop. If the island has a laminate countertop, you can probably unscrew it and then pull it off. However, if it’s stone, you’ll need someone to help you to handle the weight. Then, remove the island from its space. If the job proves to be too much, phone a junk hauling and removal service to dismantle your kitchen island and haul it off.